Over 100 people watched online Thursday night as Ming-jiu Jiang 7P eliminated Ryan Li 1P in the 4th round of the Tiangfu Cup Preliminary. Jiang will play Andy Liu 1P Friday night at 7p — also on KGS — in the final game. The winner will be the second North American representative to the Tiangfu Cup, joining Eric Lui, who secured the first spot earlier in the week. 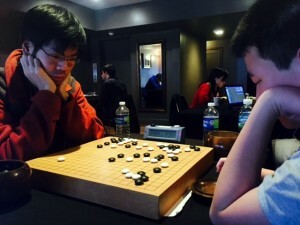 Eric Lui 1P defeated Andy Liu 1P on Wednesday night to become the first North American representative to the Tianfu Cup. Eliminated from the competition on Wednesday night were Stephanie Yin 1P and Huiren Yang 1P. Winners Ryan Li and Ming-jiu Jiang will compete Thursday night at 7:45pm on KGS as the lower bracket continues. Andy Liu will play the winner of that round on Friday for the second representative slot. Feng Yun 9P and Dalhoon Ahn 9P were eliminated in the second round of the Tianfu Cup Preliminary, played online on KGS on Tuesday. The first round was played on Monday. In the third round, to be played Wednesday on KGS at 7P EDT in the AGA Tournaments Room, Andy Liu 1P will play Eric Lui 1P in the top bracket and the bottom bracket will feature Stephanie Yin 1P (who defeated Feng Yun) vs. Ryan Li 1P and Ming-jiu Jiang 7P vs. Huiren Yang 1P (who defeated Dalhoon Ahn). The five-round double-elimination tournament runs through Friday and will select two professional representatives to represent North America in the first Tianfu Cup in China. AGA National Tournament Coordinator Jeff Shaevel is the Tournament Director. In the final set of games in the AGA Professional Qualification Tournament on Saturday morning, Andrew Lu defeated Daniel Gourdeau and Jeremy Chiu beat Sarah Yu. Lu took third place and a seeded place in the next pro tournament, Gourdeau was fourth, Chiu is fifth and Yu sixth. Thanks to the entire E-Journal team for bringing this week-long event to the world. Dennis Wheeler not only did his usual stellar job recording games, cleaning up game records and helping manage the team, but took on new responsibilities for producing our series of game highlight videos, which I think you’ll agree are an excellent addition to our coverage. The game recording team included regular LA volunteers Richard Dolen and Joe Cepiel, with the welcome addition of Greg Kulevich and Esther Jun, who both did a terrific job. 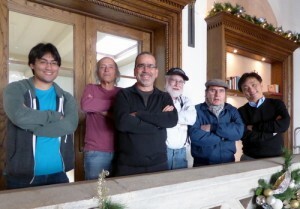 The commentary team included Myungwan Kim 9P, Tyler Oyakawa 6d, Norman Tsai 7d and I-han Lui 7d, who all did excellent work drawing out key lessons for our series of brief videos. Andrew Jackson provided tech support for the videos and Steve Colburn kept the tournament page and crosstab updated. Thanks to Akane Negishi and her team of admins at KGS for their support, as always. Many thanks as well to the staff of the Hotel Normandie, its architect and go enthusiast Jingbo Lou and the folks at Cassell’s who generously provided not only a calm and elegant venue but all the help we needed and water and coffee when we were thirsty. Special thanks to Tournament Director Jeff Shaevel for ensuring the event’s smooth operation throughout the week — as he has each year — and a very special thanks to AGA president Andy Okun, who not only coordinated the entire event with Myungwan Kim 9P, but was always there taking care of the myriad details, both tiny and big, to make the event a success, including assuming game recording duties when needed. Of course, the biggest thanks goes to the eight players who gave it their all this week — Eric Lui 7d, Ben Lockhart 7d (who also participated in a video commentary), Aaron Ye 7d, Andrew Lu 7d, Daniel Gourdeau 6d, Jeremy Chiu 6d, Sarah Yu 6d, and Manuel Velasco 5d — they are all a credit to the game and an inspiration to go players of all levels. Finally, if you’re interested in being on the E-Journal team at future events — it’s a lot of fun and a great way to improve your game — send us an email at journal@usgo.org. Ye, in his first pro qualifier, turned in a strong performance with an 8-4 record, taking second place and earning a slot as a seed in the next qualification tournament. In the lower bracket, Ben Lockhart clinched 7th place by beating Manuel Velasco, who finished in 8th place. Andrew Lu defeated Daniel Gourdeau on Friday afternoon, so they’ll play a third-game decider on Saturday morning, as will Sarah Yu and Jeremy Chiu. Lu and Gourdeau will battle for third place, while Yu and Chiu will compete for fifth; the games start at 9:30a Pacific Time on KGS. Full tournament details here; click here for video game highlights. 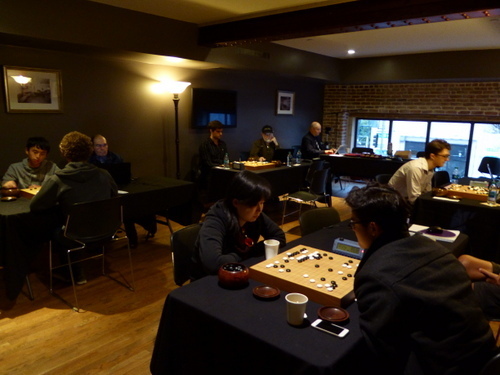 Thursday morning’s session at the AGA Professional Qualification Tournament featured just two games, Ben Lockhart vs Aaron Ye and Sarah Yu vs Andrew Lu, in a battle to move onto the semi-finals. Lockhart had an early lead but then played a couple of slow moves and Ye was able to pull ahead; a huge semeai then developed and Lockhart missed the critical move to win the capturing race (click here to see Myungwan Kim’s brief video commentary). Sarah Yu, who had played tengen in her Wednesday night match against Lu, played a similar center move Thursday, explaining afterwards that she felt the 7.5 komi was heavy and this would lead to more favorable josekis. However, she failed to make effective use of her unusual move and Lu gained the advantage. This game also developed into a crowd-pleasing semeai (click here for Myungwan Kim’s video commentary). In the afternoon matchups, Eric Lui defeated Andrew Lu by resignation, advancing to the semi-finals. Daniel Gourdeau won against Aaron Ye; he lost against Ye in the round-robin, so they’ll play again on Friday morning to determine who advances to the final with Lui. Ben Lockhart beat Jeremy Chiu, tying their match at 1-1; they’ll play on Friday morning. Sarah Yu beat Manuel Velasco, knocking him into the bottom bracket; she’ll await the winner in the Lockhart-Chiu game. The live KGS broadcast will start at 9:30a PST. - report/photo by Chris Garlock, with technical support from Dennis Wheeler. photo (l-r): Sarah Yu, Danny Ko, Manuel Velasco, Daniel Gourdeau, Andrew Lu and Ben Lockhart. CORRECTION (1/8): Our original report did not indicate that Eric Lui is in the finals and that the winner of the Gourdeau-Ye game will advance to the finals. The round-robin section of the AGA Professional Qualification Tournament wrapped up Wednesday morning with few surprises except for second-seeded Ben Lockhart’s 7th-place finish. 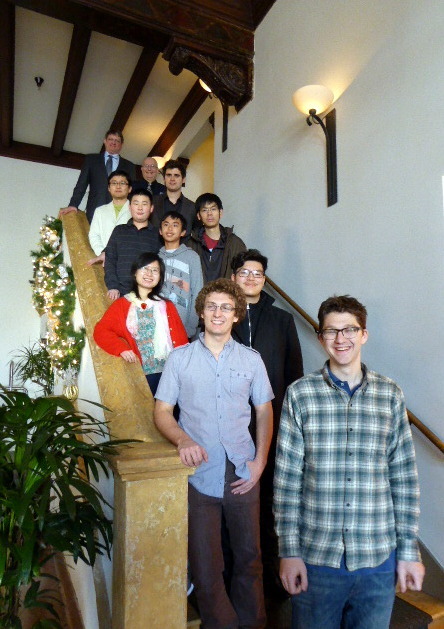 Eric Lui was first, Aaron Ye second, Daniel Gourdeau third, then Andrew Lu in fourth, Sarah Yu was fifth, Jeremy Chiu sixth, and Manuel Velasco eighth. The knockout section commenced on Wednesday afternoon as Los Angeles enjoyed a second straight day of rain, although of course the eight top-ranked North American go players at the Hotel Normandie were oblivious — or at least impervious –to the weather. The knockout section is a best-of-three, with the first game having already been played in the round-robin. Eric Lui had beaten Manuel Velasco in the round-robin and had no trouble with him on Wednesday afternoon, knocking Velasco down into the lower bracket. 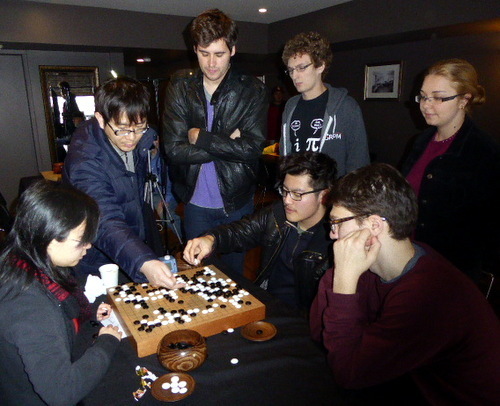 Daniel Gourdeau’s win against Jeremy Chiu secured his place in the upper bracket as well. Sarah Yu had lost to Andrew Lu in the round robin, but won on Wednesday; they’ll play to advance on Thursday morning. And Ben Lockhart, who had lost to Aaron Ye in the round-robin, beat him by a point and a half in the knockout, forcing a third game on Thursday morning. Both games will start at 9:30a PST on KGS. 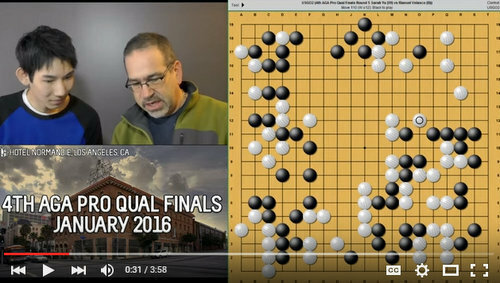 A brief video of Myungwan Kim 9P’s commentary on the Ye-Lockhart game has been posted on the AGA’s YouTube channel. The latest batch of pro tourney game highlights includes Sarah Yu (W) vs Manuel Velasco (B), Ben Lockhart (W) vs Aaron Ye (B) and Jeremy Chiu (W) vs Eric Lui (B), all from the fifth round of the round robin. The AGA’s professional qualification tournament tests the go skills of its young competitors, but it’s also a grueling endurance challenge. With two rounds each day, and each game usually going at least three hours, that’s six to eight hours a day for a full week. The concentration these players bring to bear on each game is fierce; every move is considered, and then reconsidered. I’ve seen players think about a move for twenty minutes, reach into the bowl for a stone, take it out and then put it back and settle in for another ten minutes. Even the most natural, “obvious” move must be fully read out and time, while a factor, seems to be the furthest thing from their minds as they follow the branching trails deep into thickets of strategy and tactics, move and countermove, probe and response. The silence in the playing room is deafening. Traffic swishes by outside and the sounds of a working hotel drift in throughout the day. The pinging of the elevator doors. Housekeeper carts rumbling overhead. Snatches of conversation as hotel guests walk by the room. The hum of air conditioning. As fierce as the competition is here — and every single one of the players wants to win — it’s not unusual to see two players who have just spent the last few hours trying to slaughter each other’s groups now peacefully reviewing the game, sometimes for another hour. In fact, the analysis is so cooperative and collegial that it can often be difficult to know which player is the winner and which the loser. Perhaps because they understand that in the shared search for mastery they are both winners. Garlock is leading the E-Journal’s game recording/broadcasting team at this week’s AGA Pro Qualification Tournament in Los Angeles. 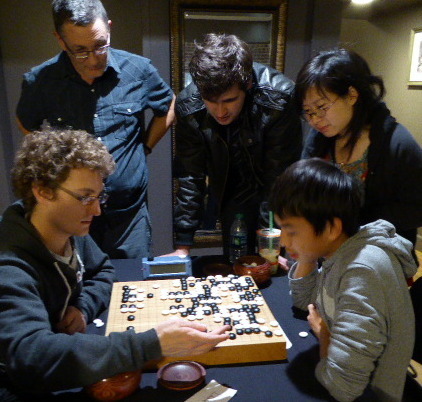 photo: Daniel Gourdeau (l) and Jeremy Chiu review their game while Manuel Velasco and Sarah Yu watch.